Karen Beasley organized this environmental project herself. 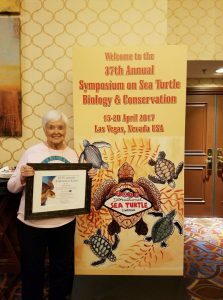 She saw the need to preserve and protect the Sea Turtle nests, nesting females and hatchlings on the 26 miles of coastline on Topsail Island. After Karen’s early death, the torch was passed on to her mother, Jean Beasley, who is now the Executive Director of both the nesting program and the rehabilitation center. 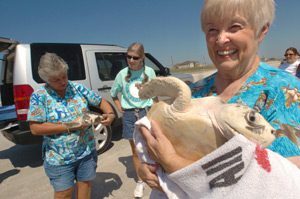 In 1996 a small group of dedicated volunteers with the Topsail Turtle Project stood on an empty lot in Topsail Beach. The group shared a dream… They received the opportunity to care for an injured sea turtle who came to be called Lucky. Lucky helped everyone recognize the need for a place in North Carolina for sick and injured sea turtles, who required long term rehabilitation. Lucky was cared for and was eventually able to be returned to the wild. The question was where other sick and injured sea turtles in need of medical attention would go for treatment and care. Thus, the dream of a place on Topsail Island to provide that kind of sanctuary for sea turtles in need was born. In 1996 the town of Topsail Beach generously offered to lease a small lot on Banks Channel to the group for such a facility. The arrival of hurricanes Bertha and Fran put the plans on hold, but the dream lived on. Finally in the spring of 1997, it appeared that plans could continue. Three North Carolina sea turtles who had spent the winter at Sea World of Florida were due to arrive back in North Carolina in mid-June. They would need a place to go for care and treatment. Could the group handle it? With a resounding “Yes!” plans accelerated and by June 19th an outdoor rehabilitation area was ready to receive Karen, Corey and the well known local favorite, Huffy. As the summer of 1997 passed, volunteers were busy caring for the injured sea turtles while monitoring the beach for nests each morning and making sure that baby sea turtles made it safely to the water each night. Each day in the background were the beautiful songs of hammer and saw. Construction had begun on the Karen Beasley Sea Turtle Rescue and Rehabilitation Center. Jean and her team moved into their new 900 sq. ft. facility in October 1997, where air and water temperatures kept sea turtles warm. Since the establishment of the rescue and rehabilitation center in 1996, hundreds of turtles have been rescued, rehabilitated and released back into the wild. Jean and her team of volunteers have worked tirelessly – day in and day out – to make the world a better place, one day at a time. The dream has become a reality. Join us at Sea Turtle Camp this summer join the team of volunteers this summer and experience the legacy first hand!